Among other findings, solar EUV [extreme ultraviolet radiation] turns out to be a greater planetary force than expected in this new research. Also the bow shock is greater the nearer Mars gets to the Sun during its orbit. As the energetic particles of the solar wind speed across interplanetary space, their motion is modified by objects in their path. A study, based on data from ESA’s Mars Express orbiter, has thrown new light on a surprising interaction between the planet Mars and supersonic particles in the solar wind, reports Phys.org. forms upstream of a planet – rather like the bow of a ship, where the water is slowed and then diverted around the obstacle. The bow shock marks a fairly sharp boundary where the solar wind slows suddenly as it begins to plough into a planet’s magnetosphere or outer atmosphere. As expected, the distance of the Martian bow shock from the planet increases as the dynamic pressure of the solar wind decreases. This is rather like a weakening of the bow wave ahead of a ship as the water’s flow slows down. Another possible factor in influencing the bow shock’s location is the orbit of Mars. The planet’s distance from the Sun is much more elliptical than that of Earth, ranging from 206 million km to 249 million km – a 20 percent difference. A team of European scientists has investigated how and why the bow shock’s location varies during the Martian year. In a paper published online in the 21 November 2016 issue of the Journal of Geophysical Research: Space Physics, the team has analysed more than five Martian years of measurements from the Mars Express Analyser of Space Plasma and EneRgetic Atoms (ASPERA-3) Electron Spectrometer (ELS) to identify 11 861 bow shock crossings. This is the first analysis of the bow shock to be based on data obtained over such a prolonged period and during all Martian seasons. The scientists discovered that, on average, the bow shock is closer to Mars near aphelion (the planet’s furthest point from the Sun), and further away from Mars near perihelion (the planet’s closest point to the Sun). 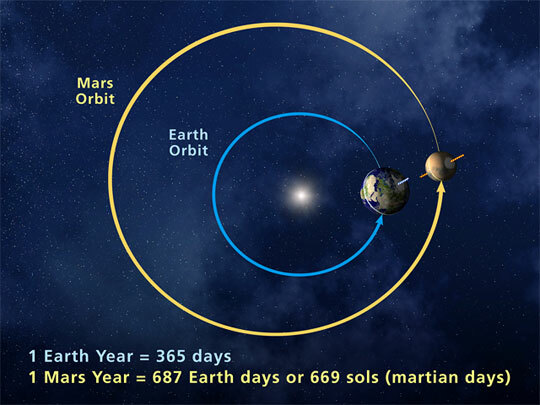 The bow shock’s average distance from Mars, when measured from above the terminator (the day-night boundary) reaches a minimum of 8102 km around aphelion, while its maximum distance of 8984 km occurs around perihelion. This is an overall variation of approximately 11 percent during each Martian orbit. Their somewhat surprising discovery was that the bow shock’s location is more sensitive to variations in the solar EUV output than to solar wind dynamic pressure variations. …variations in bow shock distance also correlate with annual changes in the amount of dust in the Martian atmosphere. The Martian dust storm season occurs around perihelion, when the planet is warmer and receives more solar radiation. For Earth and other magnetized planets, it [bow shock] is the boundary at which the speed of the stellar wind abruptly drops as a result of its approach to the magnetopause. For unmagnetized and electrically conductive objects, the ambient field creates electric currents inside the object, and into the surrounding plasma, such that the flow is deflected and slowed down as the time scale of magnetic dissipation is much longer than the time scale of magnetic field advection. The induced currents in turn generate magnetic fields that deflect the flow creating a bow shock. For example, the ionospheres of Mars and Venus provide the conductive environments for the interaction with the solar wind.